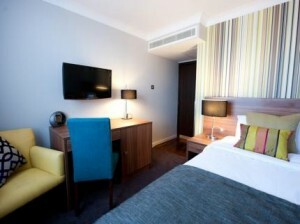 The Best Western Mornington Hotel is located in Center London, in the very heart of the city, just across Hyde Park. Therefore the location is ideal for everyone: shopping tourists, business men, culture addicts and so on. The four stars hotel is hosted by a Victorian building from 1860, so refinement and class is cleverly designed to intersect with modern technology and features. Thus the guests of this accommodation can have the most wonderful conditions. Besides the classy exterior and the beautiful and elegant rooms, the Best Western Mornington Hotel also offers great location and surroundings: the beautiful Hyde Park is just in front of the hotel and nearby we can find the best shopping and entertainment areas. Also, the accessibility to this accommodation is definitely a plus: the Lancaster Gate Tube Station is within the walking distance of only 3 minutes and the Paddington Station-Heathrow Express Station is at a 5 minute walk away. In order to get rail transport from London Gatwick Airport to Best Western Mornington Hotel you need to take the train from the Gatwick Airport Station to Clapham Junction. The train comes every approximately 15 minutes and the journey takes about 24 minutes. From there, the next stop is Shepherd’s Bush (Central) and Lancaster Gate. The last station is minutes away from the hotel. An alternative implies taking another train from the airport to Farrington Station and then to Paddington, which is 0.4 miles away from the hotel, meaning a 7 minutes walk. London Gatwick Airport is 30 miles away from Best Western Mornington Hotel. If you want to travel by car, you have to take the M23 road to enter the city, then the A23 Road until Coulsdon South. You will then have to follow the A237, Trinity Road and then cross Wandsworth Bridge. The hotel is located just behind Hyde Park, on Lancaster Gate Road. 247 Gatwick Airport Transfer can always provide you with a Best Western Mornington Hotel. The price for a Saloon car is £57 and the journey can take up to one hour and 40 minutes, if we include any traffic delays that may occur in rush hour time.